Have you been watching the nature documentaries for years wishing you could be as close to those wild animals as they are on television? Well dream no more, you too can have your own slice of the African wildlife living in your living room at home. 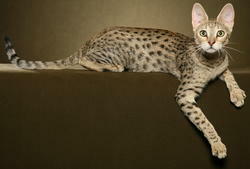 Introducing the Savannah, this is a domestic, pedigree cat that is recognized by the QFA Inc. in Queensland. The Savannah is derived from the African Serval and breed with domestic cats to produce the Savannah. They were originally founded by Joyce Stroufe in Oklahoma in the 1980's with a team of skilled and passionate breeds they have perfected the breed to produce Fertile F4 Males, having the Savannah recognized by TICA (The International Cat Association) for a number of benchmarks such as the first Savannah litter and also the first SBT Savannah. We are honored to have these Savannahs introduced into Australia with their lengthy history only the best of the best will be produced here from The founders of the breed world wide. 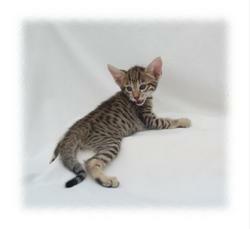 The Savannah is a playful and loving cat who is interactive and beckons to be an active member of your family. The Savannah loves the water and will often use their water bowl as a play toy and bat the water out and over itself, being larger than a normal house cat means that they can jump higher, up to 2 meters. So with a wild spotted look with long lanky legs and big ears that will play like a dog, walk on a leash and take a swim with you in summer you get your own African Wild cat that will play and interact with you without the threat of a wild cat. For more information about this breed, or to be among the first in Australia to own your very own Savannah Cat, visit the Savannah Cats Australia web site.